The establishment ”Rzeźba w drewnie” was set up in 1989 in Łomża. Zbigniew Godlewski is the manager. At present the company has it’s seat in Kupiski Stare. Our products are sculptures and bas-relieves. They are all made of linden and birch. They are little forms, not higher than one meter and they can be baught in shops with devotional articles. 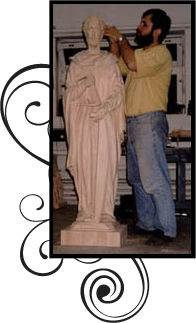 I also carve big forms such as crosses, sculptures, the Stations of the Cross for chapels and churches. The colouring depends on the place of the destination of the articles. The materials we use are water mordants, nitro strains, varnish, waxes-natural and artificial. The material I use is linden and birch. Before the treatment the material is seasoned and after that it is dried. The material prepared in such a way is ready to be changed into sculptures or bas-re-liefes. Our company makes also carved elements of furniture (applications with ornaments, capitals, balusters, breastsum-mers).